Are You Ready for the Holidays With Your Challenging Child? Are You Ready for the Holidays with Your Challenging Child? originally appeared on Babble.com. The holidays can be a special time for families -- attending parties, opening gifts, and spending time with friends and loved ones. But for parents of children with challenging behaviors, the holidays can be fraught with stressful moments, unrealistic expectations, and potential conflicts. Trish and John, and their 4-year-old son Jaden, are well-acquainted with these highs and lows. While most families deal with stress around the holidays - shopping for gifts, decorating the house, and all the usual preparations - Jaden's unpredictable behavior really exacerbates the seasonal tension for his parents. He's an excitable, impulsive child who has had significant emotional and behavioral challenges from the time he was very young. His conduct at daycare has been the source of much concern in recent weeks, but Trish has set that worry aside for now because a holiday visit to Aunt Margaret's is on the agenda again despite last year's debacle. Related: To my son, screaming "mama"
It started with Margaret's ban on television and video games, which are two common strategies John and Trish use to help keep their son calm. Then Margaret got on her soap box about how today's parents are too easy on their children, as she gave a blow-by-blow account of her childhood punishments. Jaden was not impressed (neither were John and Trish). Moments later, he started screaming, scattering board game pieces in every direction. On his way out of the room, Jaden bumped the lamp off the side table and into Grandpa Larry's cocktail. It would probably have seemed funny on TV, but for Trish and John this was real life, and they were headed home before dinner was served. 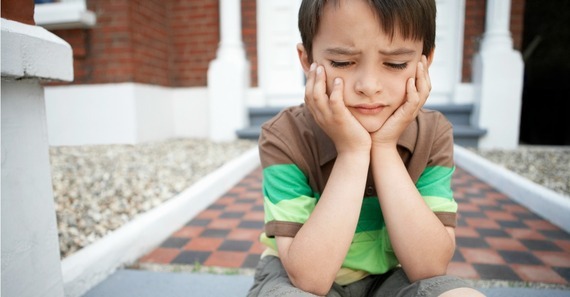 Children with challenging behavior are more likely to experience increased excitement or anxiety when routines are altered and unfamiliar people and places enter their world. Throw in the impact of sweets and treats and erratic bedtimes, and a meltdown may not be far behind. Related: Do you feel like you're losing the bedtime battle? 1. Limit participation in holiday festivities. It is easy to get swept up in the excitement and the expectations that come with it. Chances are, your child isn't going to do well in a whirlwind of activity. Instead, work with your child to pick and choose activities, and be sure to leave time in between to rest, relax, and recharge. Excitement and activity doesn't always equal happiness, and you should plan accordingly. 2. Talk about expectations ahead of time. Most kids do better when they know what's coming. Before you go to a family gathering, talk with your child about who'll be there, what you'll be doing, and about behavior expectations. Many families have success with some quiet time when a child can be alone for a while during the festivities with a book or an iPad. Try framing this as a special opportunity or reward for your child for good behavior. 3. Think about ways your child can contribute to the festivities. When moms and dads are busy in the kitchen or preparing the gifts, kids can sometimes feel left out and they may do negative things to get your attention. By including them in the planning and preparation, kids will feel more involved and less anxious. For example, you could bake cookies together, so that they have something special to bring to the party. 4. Establish your own holiday routine. No matter what holidays you celebrate, or the time of year when they occur, it can be stressful following someone else's schedule. Why not establish your own holiday routine? Make time for new traditions without deviating too far from usual bedtimes and mealtimes. Do the things your immediate family wants to do - not what Aunt Margaret and Grandpa Larry are expecting. Develop a realistic plan that fits your family's needs, and stick to it. Chances are you and your child will have a happier holiday. Have a good holiday story to share? We'd love to hear from you. Your experiences in dealing with your child's challenging behavior at this time of year may help others get through the holidays with a little less stress. Please share your thoughts and experiences! I never thought I'd have "that kid"